At Zimbra COMMIT, we’ll review the roadmaps for what has been delivered in Q3 and how we’re delivering accelerated innovation – in collaboration with our Open Source community – that addresses the changing expectations for how people work and collaborate with each other, and the changes we are making to make around Zimbra to make it easier for developers and partners to extend Zimbra functionality and the Zimbra experience. Zimbra Q3 COMMIT will be a technical confab for code contributions and product updates. 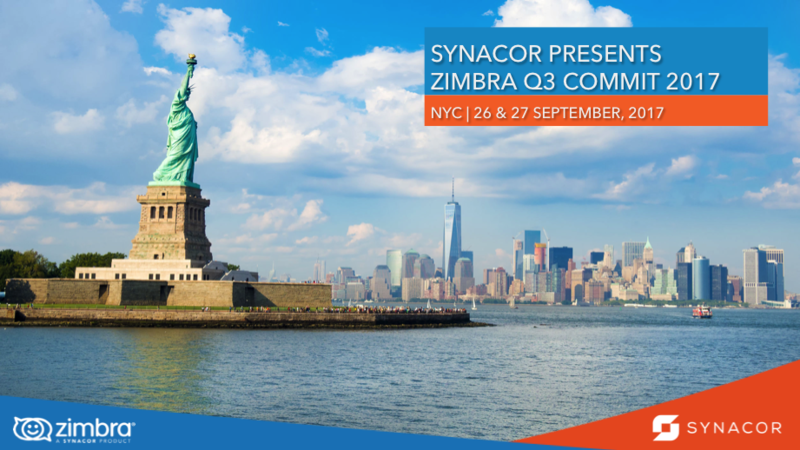 To kickoff Zimbra COMMIT Q3, on September 26, Synacor welcomes you to beer and NYC pizza at Synacor Headquarters, 450 Seventh Avenue, 43rd Floor New York NY 10123. It will be the perfect occasion for you to meet our team and network with our community of worldwide contributors. On September 27, the main event will take place at Cliqk Home Showroom, 241 Centre St New York NY 10013 for a full day packed with content, panels and contributions! Register now for Zimbra COMMIT before all seats are gone! As usual, do not hesitate to visit our website www.zimbra.com or contact us directly if you have any questions. What were the highlights of this commit and what can we expect from Zimbra in future , can you post it here or better put a link , something similar to Zimbra APxJ, 2017. Where is Zimbra Universal UI heading, when can we expect that to be completed ?